This is a great example of the Miser's Purse. Many names are used to describe purses of this type including the ring purse, stocking purse, long purse and string purse; all which are self-explanatory! For nearly 150 years Purses like this have been used - from around the 1780's in the18th Century until the 20th Century. Apparently as late as 1925 patterns for making them were still appearing in popular magazines . They are a clever invention which allowed coins to be safely stored at each end of the purse. The coins would be retained and accessed by simply sliding a ring along the item. Miser's purses were designed for both gentlemen and ladies to use. The purse could be suspended over a belt. I think this one dates from just before the Victorian period say 1800 to 1830, however it could be later as this is only a guess based on some photos in one of my reference books! It also looks more like the ones that were made in France so could well be continental. The book tells me that earlier English examples were larger in size, I guess the Cartwheel Penny that would have been currency in Georgian England would have needed a big purse! I think that French coinage from this time was smaller so that could well fit the estimated date and place of creation for this particular item!This lovely example has been lovingly hand-made. 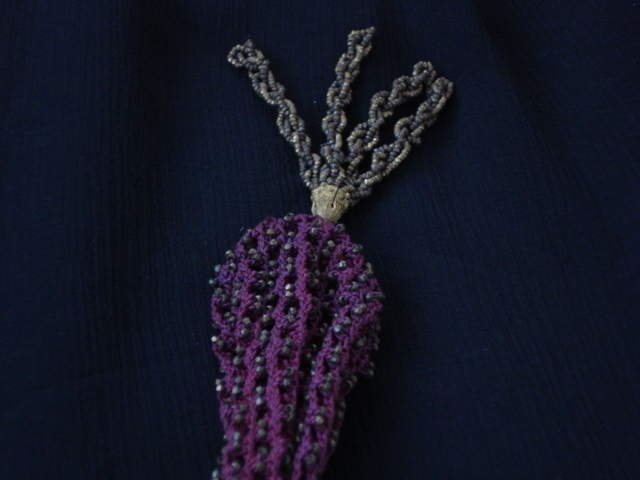 It has a burgundy red hand-knitted, or maybe even crocheted or netted, body with beadwork. The beads look a lot like cut steel beads but appear to be made from brass rather than cut steel. 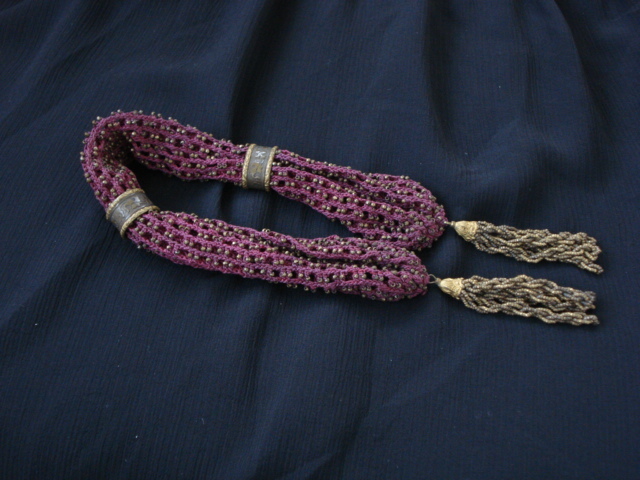 The same beads are used to make two plaited tassles to decorate each end of the purse. It has two rings (one appears to be oval in shape, whether it has got slightly squashed over time or whether it started out as an oval I don't know!) 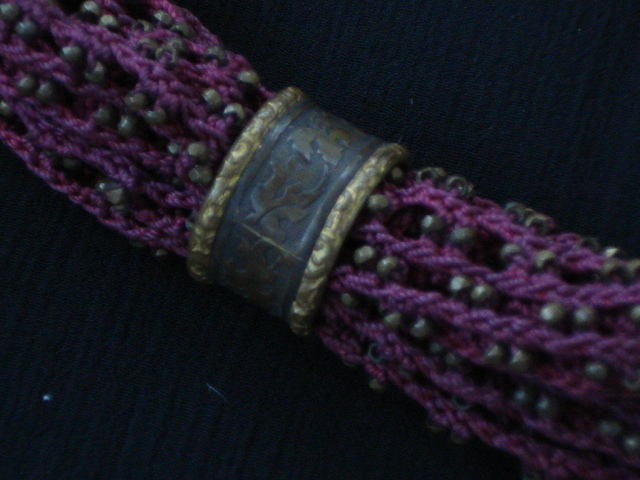 the rings are brass with gilding to the edges.The tassles dangle from two gilded decorative cups. 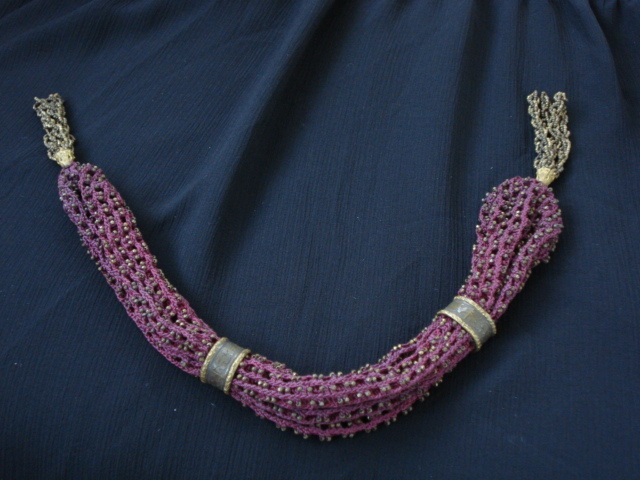 This Misers Purse measures 11 ins by 2ins (28cms x 5cms) on the beaded crimson red part with tassles of approx 2 inches (5cms) at each end. The apperture for inserting the coins is 4 inches long. It is a joy to find something of over 150 years old in such a great condition,it is in really good order with no holes or damage, but I guess the colour will have dulled over the years from a vibrant crimson red to the burgundy red it is now. 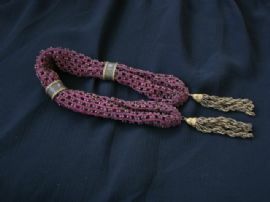 Perfect for collectors of early bags and purses, or people who love beadwork and unusual items from the past. Designer or Brand: None, this is a hand made antique item.